Only $56.00 per seat... children under 10 years half price. During the spring and summer seasons an abundance of marine life will thrive throughout the tidal waters near Ingonish. Fortunately this prime location is only a short zodiac ride away. 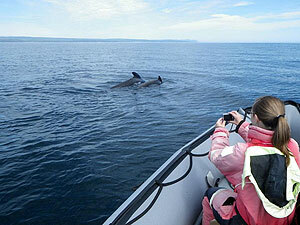 The most frequent sightings are big Fin whales, dolphins, Minke whales, Humpback whales and Pilot whales. Seals and Puffins are observed on nearly every tour. Our sightings success rate is one of the best in Atlantic Canada, achieving more than ninety-five percent! 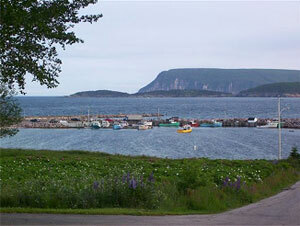 The Ingonish area, Cape Breton Island, Nova Scotia is a destination for everyone. You will be inspired by the breathtaking coastal and mountain scenery while spending days along the sandy shores of Ingonish Beach which offers both saltwater and freshwater swimming. Challenge yourself in the oceans waves in a kayak or unwind under a canopy of trees. The area is known as a golfers paradise with the famed Highlands Links, which is considered by many to be Canadas finest course. There are abundant hiking trails that range from walks along coastal headlands to highland ascents. Hikers of all levels gather for the Hike the Highlands Festival www.hikethehighlandsfestival.com in September.